Maiden Sassy Agnes put herself on the map in a big way on Saturday when she won Finger Lakes’ co-featured Lady Finger Stakes, a 6-furlong dash for New York-bred 2-year-old fillies worth $112,388. Sassy Agnes’ victory also gave her freshman sire Central Banker his first progeny stakes winner. A top-ten first crop sire nationally, Central Banker stands in New York at McMahon of Saratoga Thoroughbreds. 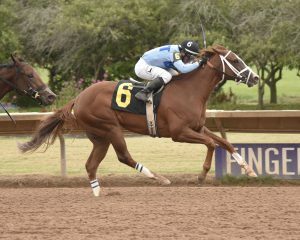 This year’s Lady Finger Stakes attracted a robust field of nine, including five maidens who had earned the confidence of their connections to give this stakes race a try. Such was the case with Sassy Agnes, a Linda Rice-trainee for Beach Haven Thoroughbreds, who contested the Lady Finger on short rest. Unveiled at the Spa on August 1 in a turf sprint for state-bred fillies, Sassy Agnes finished off the board following a slow start. At the close of the meet, the chestnut filly resurfaced on dirt and fared much better, finishing second after setting the early pace. Rice deemed Sassy Agnes ready to ship to Farmington six days later to give the dirt another try in the Lady Finger. After the gates opened Ma Meatloaf (5-1) was hustled to the front from post eight, while Sassy Agnes (5-2 second choice) caught up to her from mid-pack and 3-5 favorite Shesasuperfreak — who ran to her name on debut when she aired by 10-plus lengths at Saratoga on August 15 — was forwardly placed from post two. Shesasuperfreak went on with it at the rail while Sassy Agnes set up at her flank along the backstretch and the quarter went in 22.34. Ma Meatloaf chased in third three lengths back, while her stablemate from the Jeremiah Englehart barn, Jaded Lady, pursued another length back in fourth. In the approach to the far turn Sassy Agnes drew even with Shesasuperfreak and passed her by at the three-eighths pole. Opening up daylight as Ma Meatloaf took over second, Sassy Agnes hit the head of the lane in full control. Increasing her advantage to as much as four lengths with a furlong to go, Sassy Agnes saw her lead erode late as Ma Meatloaf unleashed a strong closing bid to her outside. The wire came too soon for the challenger to complete her mission, however, and Sassy Agnes finished first with three-quarters of a length to spare. After a half-mile in 46.45, she completed six furlongs over the fast going in 1:12.94,.03 faster than La Fuerza who won the Futurity one race before. Bred by Klaravich Stables and foaled at McMahon of Saratoga Thoroughbreds, Sassy Agnes is a graduate of this year’s OBS March 2-year-olds in training sale, where Beach Haven Thoroughbreds made a winning bid of $105,000 after the filly breezed a furlong in :10 seconds flat. Sassy Agnes, who has earned $83,182, issues from a familiar New York family. She is the first foal out of Bullish Sentiment, an unraced daughter of Stormy Atlantic. Bullish Sentiment is a full sister to Stormy’s Majesty (bred by Majesty Stud, LLC), winner of the Grade 3 Discovery Handicap, three other stakes races and earner of $336,649. Their dam is stakes performer Raffie’s Dream. Bullish Sentiment has produced yearling and weanling full sisters to Sassy Agnes and was bred this year to Constitution. Sassy Agnes’ successful young sire Central Banker is a Grade 2-winning sprinter by Speightstown out of multiple stakes winner Rhum. He stood the 2018 breeding season at McMahon of Saratoga Thoroughbreds in Saratoga Springs for a stud fee of $7,500.